Many years ago I would attend Irish step-dancing classes in the local community centre. I never really had much of a sense of rhythm, but I loved the classes. But the best part of the class would come once we had finished and we were free to visit O'Murchú's shop. I think every child learns economics at a young age, when they are figuring out how to extract maximum value from their precious pennies. I would often go for a chocolate bar, a packet of Tayto crisps and I would use whatever change was left over to buy an assortment of penny sweets. This was the middle to end of the 80s after all, and every penny mattered in those years. My friends and I would then walk home, eating our haul as we went. The walk was over a mile long, up and down some very steep hills, thus helping to burn off our calorific intake (not that we cared about such things at that stage in our lives). One of my very favourite treats was to take a square of chocolate and eat it together with some Cheese & Onion crisps. I was convinced that this was the best flavour combination ever. Last year, Tayto starting selling a plain bar of milk chocolate, with Mr. Tayto emblazoned on the wrapper at their Tayto Park in Ashbourne, Co. Meath. However, word quickly got around on Twitter that it was "just" plain chocolate, and didn't actually feature any crisp content. 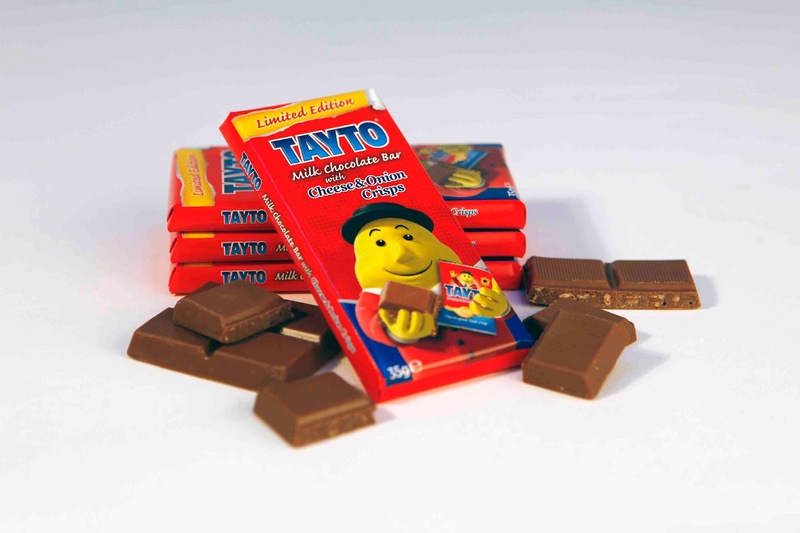 A strong viral campaign eventually resulted in Tayto teaming up with Butlers Chocolates to make the holy grail of chocolate bars, featuring milk chocolate containing pieces of Cheese & Onion crisps. I may have enjoyed many new flavour combinations since my childhood adventures, but I still think that chocolate and crisps is a winner. I'll be keeping an eye out for this bar, and the subsequent trip down memory lane. This limited edition Tayto product is available in Tayto Park in Ashbourne Co. Meath and will be stocked in Londis, Gala, Costcutter, Topaz, Spar, Mace, Eurospar, Daybreak plus other select retailers by the end of April. But be warned, there will only 100,000 bars in circulation. More information on Tayto can be found at on Mr Tayto’s page on Facebook, or follow Mr. Tayto on Twitter - @MrTaytoIreland. The Tayto Factory and the Cadbury factory are pretty near each other in Coolock (or at least they used to be). When the wind was blowing the right way you would get a weird mix of both smells. I still think whoever came up with this idea was inspired by that.